Summary: This delicious raw chocolate sauce is a riff on a recipe from Shazzie and David Wolfe's incredible book, Naked Chocolate. 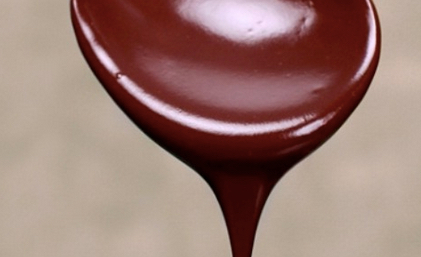 This is as true a dark chocolate sauce as you could want. It's delicious over 5-Minute Raspberry Sorbet! This delicious raw chocolate sauce is a riff on a recipe from Shazzie and David Wolfe’s incredible book, Naked Chocolate. It’s incredibly easy, amazing delicious (and so good for you), and tastes great on 5-minute raspberry sorbet! This is as true a dark chocolate sauce as you could want. Mix the agave syrup and the oil or water together. Slowly whisk the raw cacao powder into the agave syrup mixture, mixing it in until well-blended into a smooth sauce. The amount suggested here is a rough guideline. How much cacao powder you will ultimately use depends on the consistency you want. Do not use a food processor or Vitamix for this recipe. Use a bowl and a whisk or a paddle (or spoon). Note: Most raw food recipes call for coconut oil in recipes like this. So do I, but if you don’t, experiment! You may like the coconut oil, or you may prefer some other raw, cold pressed nut oil. You can even forego the oil altogether, but it does impart a nice consistency and mouthfeel to the chocolate sauce. Deep Dark Delicious Raw Chocolate Sauce is delicious over 5-Minute Raspberry Sorbet. I made this with raw coconut flour, rather than cacao powder, and it was delicious! Added in a mashed banana and raw cacao nibs, and ate it just like that. Great, quick, treat.